GMC Sierra full-size pickup trucks have a lot in common with Chevy’s Silverado models when it comes to the mechanics but distinctive styling and interiors are the areas which divide these models and many opinions are inclined toward the GMC models considering them as somewhat more stylish and modern looking trucks. Adding to that is probably the range top Denali trim available on both the light- and heavy-duty Sierra models. The Denali trim builds on the truck traits with the emphasis on the premium look and styling with the use of the premium materials. With that, the Denali trim also quarantines a high level of comfort and availability of advanced tech and safety features. 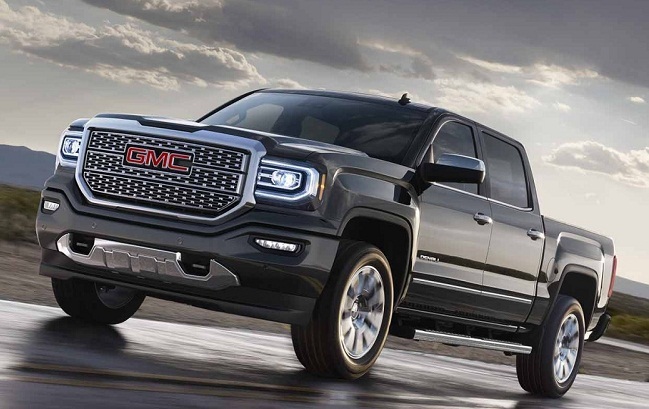 Considering that, we can think of the Denali trim as the standard for the premium-level truck and if you want to get “everything” from your pickup truck the 2018 GMC Sierra Denali should be your choice. Exterior design is something which definitely stands out the Denali models from the crowd. The 2018 GMC Sierra Denali models will get attention with the Denali specific accents, attractive lighting, bold lines, plenty of chrome and unique wheels. The dominating element of the Denali styling is the signature grille which makes this version easily recognizable. However, high-performance LED headlamps combined with brand’s signature LED lighting also give a distinctive character to these models. Standard on the Denali trim are also the LED fog lights and taillights. The Denali-badged models also feature chrome side moldings, mirrors and door handles combined with the body-colored bumpers. What also adds to the attitude of these trucks are unique 20-inch alloy wheels. Some versions also have an option of 22-inch chrome-accentuated wheels. Other features include assist steps which design depends on the version, spray-on bedliner, available power sunroof, etc. Interiors of Denali models give attention to premium comfort and details alongside with the top-notch features and materials. The standard on these models are heated and ventilated power-adjustable front seats. The perforated leather upholstery and heated steering wheel also come by default on this trim. The Denali cabin also features aluminum accents and contrasting stitching. An improved sound insulation and active noise cancellation also make the cabin very quiet place to be. The models also come with the latest entertainment and safety technology. The IntelliLink infotainment system with the 8-inch touchscreen provides smartphone compatibility, voice commands, 4G WiFi hotspot, HD radio, premium sound system, etc. The safety of the passengers is also on the high level thanks to the availability of some advanced driver aids. The Denali models, depending on the version, include lane departure warning, lane keep assist, forward collision alerts, parking sensors, safety alert seat, etc. All 2018 GMC Sierra Denali models will get motivation from the V-8 engines. The base engine on the light-duty Sierras will be a 5.3-liter EcoTec V-8 which uses active fuel management, direct injection and Variable Valve Timing. This engine has the potential for 355 hp and torque of 383 lb-ft. An option on the Sierra 1500 is a 6.2-liter EcoTec V-8. This engine can produce 420 hp and 460 lb-ft of twisting. The transmission system is an 8-speed auto box. The heavy-duty capable Sierras with the Denali badge will also get two engine options. A 6.0-liter Vortec V-8 can provide 360 hp and torque of 380 lb-ft. The better solution is a 6.6-liter Duramax V-8 turbodiesel. This engine delivers 445 hp and torque reaches an impressive 910 lb-ft of torque. Two six-speed automatic transmissions are in the play. The Duramax diesel engine works in the combination with the Allison 1000 six-speed automatic gearbox. The 2018 GMC Sierra Denali should arrive in late 2017. The price should start from around $53,000 for the light-duty model. The HD models will cost from around $56, 000.